You see, things started out this week with the Internet being down for most of Monday in the office, but an 11-plus hour workday later, and I managed to get back on track. Tuesday was just as much fun, and the rest of the week isn't shaping up to be a ride on Space Mountain, either. But at least it's Wednesday. And that means comics. Not a huge week of books, which is good because my wallet couldn't take another hit like it did last Wednesday. But still, there's some pretty cool stuff coming out today, including what I think is the best release of the month. From BOOM! Studios, the trade paperback collection of Mark Waid's first arc on the new, and wonderful, dark super hero opus, Irredeemable hits stands today. This release is significant for a few reasons. First, I think this is Mark Waid's best work, period. And considering his body of work, that's saying something. Irredeemable asks the question, "What happens when Superman goes bad?" Only it does so without Superman, or the Justice League. Or those pesky DC editorial notes. Unlike so many Superman stories that simply ask the above question and have other heroes talk about contingency plans and the like, Irredeemable flat out shows us what happens when a hero of that power level goes bad. And, because it's a creator-owned book, Waid never has to worry about angering long-standing fans of the characters, or long-standing editors of the characters. They're his characters, they're brand new, and he can do whatever he wants with them. And the result is really an inspiring achievement, and something NEW, in an industry that enjoys reusing the same old tropes time and again. Speaking of new and different, BOOM! is trying something pretty interesting with this week's release of the trade. Also shipping is issue five, which is the first part of the next story arc. The cool part is that the publisher has decided to mix things up and offer issue fivefor $.99, and the trade (the first four issues collected) for $9.99. If you haven't been reading the book, and want to jump on board but have been weary of starting in the middle, you can catch up completely today for $9.99. Now, mind you, each issue of the series prior to issue five shipped for $3.99, so getting those books in a much cheaper trade is an effort above and beyond in the comics industry today. I really applaud BOOM! on this, and I hope it pays off for them. More than that, I hope the book picks up a bunch of readers, because this is good, good stuff. 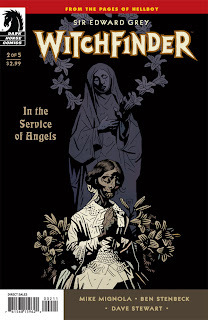 Moving on, we have Mike Mignola's latest offering in Dark Horse Comics' Witchfinder: In the Service of Angels, issue two. I picked up issue one last month really on a whim, and I'm glad I did. I love Mignola's Hellboy work, and I've been meaning to read more of his BPRD mini-series. Well, while I still haven't caught up with those books, I did pick up Witchfinder, about a character who was introduced WAY back in an early Hellboy comic. Sir Edward Grey is a Victorian Era occult investigator in the service of the Queen, and in this series he is on a mission to investigate London's infamous secret society, The Heliopic Brotherhood of Ra. And he fights a ghost. I love this book. Beautifully written by Mignola, Witchfinder has terrific, moody art by Ben Stenbeck and it's colored by the great Dave Stewart. 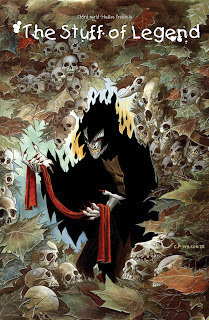 I'd recommend this title to all fans of Hellboy, or House of Mystery, or classic Hellblazer. It's some good old fashioned thinking man's (or woman's!) horror. And finally, a quick note about The Stuff of Legend, a comic I featured on last week's Waiting for. Well, I was right. This book is hot. And, unfortunately, very hard to get. My LCS didn't get any copies of the book, nor did any of the shops in my area. Luckily, I had some time that afternoon to order the book directly from the publisher, Th3rdworld. When I went back on the site a few hours after placing the order, I was kind of shocked to see that the book was completely sold out there, too! There's a second print coming (or that might be gone, too), and I think there's a special edition second print that's out for $15 on the site. Whatever the case may be, this book has gotten incredible reviews, and add that to the fact that it is from a small publisher, and stores ordered (very) lightly, it's going to be one of those stupid collectible issues. Which really stinks if you just want to read the darn thing. Now, listen, I'm certainly not begrudging Th3rdworld, as they are a small publisher, and I'm happy that they're receiving so much attention in the comics media. But I just want to read the book! I haven't received my copy of issue one yet, but I'm assuming the site was inundated with purchases last week, and I'm not holding my breath. When it does arrive, I'll be sure to review it here, and let everyone know if I think it warrants the hype. That's all I've got for today. But before I go...what are you Waiting for? I hear that, man. But, even though it is a paltry 4 issues, unfortunately today we need to take into account the fact that each issue of Irredeemable was $3.99 when they hit stands. So, looking at it through that (horrible) prism, getting the first four for under 10 bucks is a steal. I have read the two issues of Rebirth that shipped--they're good and the art is great, but each one has been late. That's one I'm going to trade wait on from here on out, I think.